You can't have an event without people. Boost your attendance with these these 10 effective and proven tactics for increasing ticket sales for your next event. As an event planner, have you had to face the problem of ticket sales remaining stagnant as event day approaches? Maximizing ticket sales at your event or conference can often be a challenging endeavor. Selling tickets is not just about marketing your event, but also requires sales savvy and an understanding of your audience. In order to help event professionals struggling to increase their ticket sales, we've put together an actionable guide based on event marketing best practices. Get ready to see those ticket sales make like an escalator and go up! Creating a competition is a great way to promote your event and boost ticket sales. Just make sure to keep it relevant, like offering an award to the attendee who can generate the most ticket sales through referrals. To create a competition like this, you can use your event management platform to create a custom tracking link for those who opt into the competition. Whoever opts into the competition can share that link with friends and colleagues, and because it's trackable, you'll be able to see how much revenue that a participant has generated. The person who generates the most ticket sales can be awarded a prize during the event. This example can be especially beneficial as it incorporates social media, which is great for increasing ticket sales as well as for generating awareness of your event to a larger audience. Creating a group for your event on LinkedIn can really help to score more ticket sales. LinkedIn Groups allows for collaborative group discussion, which is an effective way to organically generate conversation surrounding your event. Make sure to make the group you've created public so that you can invite both registered attendees and non-registered attendees whom you think will be interested in attending. Not only would you be integrating your event throughout social media but you would also be exposing your event to many qualified people in your industry. Be sure to include a direct link to your event registration platform within your LinkedIn Group. An additional benefit of LinkedIn Groups that can help you increase event ticket sales is that Group members automatically receive updates about Group activity via email. That means that you'll be engaging members not only on social media, but also via email. As we've discussed before, email marketing is another great way to increase event ticket sales. (Talk about killing two birds with one stone). When considering an event management platform, be sure to choose one that offers the option of selecting different types of tickets. For example, you can offer a premium ticket option, an early-bird option, as well as an option for those who can’t attend the entire event. Multiple ticket types allow you to accommodate a larger audience, and that means you can increase event ticket sales. Offering discounted tickets to groups is also a great tip for selling more tickets. The Fundraising Authority notes that a great way to sell to groups is to contact the sponsors for your event and, ask your sponsor to bring their company to your event. Make sure the sweeten to deal by offering your sponsor discounted group pricing. You can learn more about finding and getting the most of event sponsors in The Event Sponsorship Ebook. Putting event promotions in creative places like your email signature or your social media cover photos is an easy and 100% free way to let your audience know about your upcoming event. You should also include a link to the ticket-purchasing page or registration of your event website. In order to further increase event ticket sales, consider inserting a pop-up or banner on your event website. Sumo Me offers a free pop up that can easily be installed on your event website. Facebook CTA, or "Call To Action" is a tool that helps Facebook events connect more closely to an event organizer's goal: increase event ticket sales. By inserting a CTA on your Facebook page, you can easily direct already engaged fans and followers directly to your event website registration page. To implement Facebook's CTA, first, create a Facebook page for your event. Then, while viewing your Facebook page as an administrator, click the button that's labeled "Create A Call-To-Action Button." Facebook will bring you to a pop-up screen where you can modify the CTA text, and insert a link to your event website. Remember Facebook has plenty of other tools that will help with marketing your event. The different types of ads that can be used to promote your event on Facebook can be highly effective so as long as they are being utilized correctly. Watch the video below to learn more about using paid ads on Facebook. Using your speakers’ online networks can really help to increase ticket sales to your event or conference. Ask your speakers to use their social media accounts as a platform to promote the event is something event organizers should consider. Good conference or event speakers should naturally want to promote your event on their social media accounts, if more people attend your event, more people could also attend their sessions. Conference speakers naturally want as many people to attend their sessions as possible. It reflects well on them and provides them a better opportunity to promote their personal brand or service, at least tacitly, to event attendees. In addition to encouraging speakers to share information about your event on their social media profiles, you can also ask them to write a guest post for your event website blog. They can write about their area of expertise, which can really help to get potential attendees interested in your event, and thus can help you to increase event ticket sales. Additionally, you can then promote that blog post on your social media channels and via email marketing. Another way to reach a larger audience, and therefore increase your ticket revenue, is to reach out to past attendees. You can reach out by sending a tailored email reminding them of your past event and potentially offering a discount to your next one. Newsletters are one of the most successful event promotion strategies. That's because email newsletters are usually sent to an audience that has already opted into your company’s updates. Therefore, the chances of this audience following through with purchasing an event ticket after seeing an event listed in the newsletter are higher because the audience is more engaged from the start. The beauty of email marketing for events is that emails can be intelligently segmented for various recipient types. 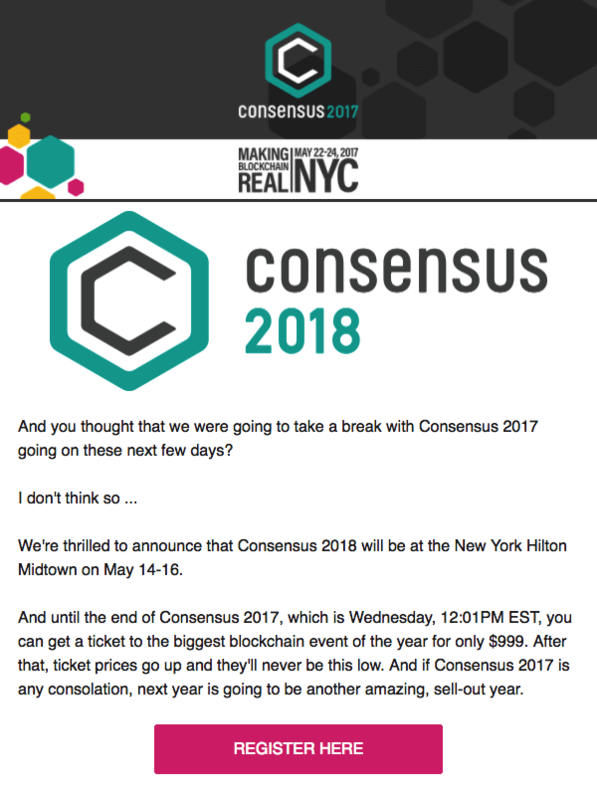 So for example, if you have a list of startup founders and another list of CMOs, you can send them two completely differently worded emails that reflect different value propositions that will uniquely appeal to these two types of attendees. Sending segmented marketing emails can truly help you to increase event ticket sales. To help you segment your emails, consider using a stand alone email marketing platform or an all-in-one event management platform that allows you to manage contacts and send emails. Either way, sharing targeted information with potential event attendees is a great way to increase conference ticket sales and spread the word about your event to highly qualified people. What better way to secure ticket sales than directly after an event has concluded? After an event you have a whole group of potential attendees who have just had a great experience at the your event. Offering an early-bird discount to those who choose to purchase tickets for your next event is a great incentive to increase event ticket sales. After all, exclusivity and a sense of urgency are great motivational factors for your potential attendees to make the move and buy an event or conference ticket. Although this seems simple, having a strong event brand can make a huge difference. Using a creative name for your event will catch more people’s eye than a mundane or long, complicated name. Strong branding is very important to selling more event tickets. A well-designed and cohesive logo, brand, and event name across the board can do wonders for the power of your event by making it easier for attendees to find in search, and easier to remember in general. Whether it be blog posts, videos, or a combination of both, content should always be a go-to solution to help promote your event. Pre-event content marketing campaigns are meant to inform and educate people about the event prior to the start date. This helps to build up momentum that will hopefully translate into ticket sales. Bear in mind that the focal point of content marketing is to offer something of direct value to your audience. Yes, you are trying to promote your event but not in a such way that comes off as too self-promotional and disregards the interest of the reader. Think of content campaigns that will both inform readers of your event while also offering helpful takeaways that they can utilize. For example, you can launch an interview series that spotlights previous event attendees based on job title and show how they were each able to gain a key takeaway that they applied to their day-to-day work. A content series like this would help potential attendees decide if the event would be a good fit for them. With today's consumers being flooded with different advertisements and promotional messages, there is something refreshing and impactful about word-of-mouth marketing. Apply this same principle to your event strategy by incentivizing attendees to share their registration links to their social networks. Build in an incentive so that for each new registrant who signed up with a referral link, the attendee who shared that referral link will receive a discount or other type of prize. Ensuring a high number of event ticket sales requires a large enough audience to market towards. Take advantage of all audiences available to you, including the ones that are used by your sponsors. Brainstorm different ways you can tap into their audience and propose well thought-out strategies to your sponsors so they know that you did your proper research. Remember that your sponsors want your event to be as successful as possible. Confidently approaching them with joint marketing strategies will show them that you are willing to think outside of the box to increase ticket sales and that you are willing to take different initiatives to achieve the end goal. Having a smooth and intuitive event registration process is crucial to securing a ticket sale. The best way to ensure this is to make sure your potential registrant doesn't have to leave your event website in order to purchase a ticket. This makes for a distracting and off-brand user experience since they will not be exposed to your event brand throughout the process. By keeping the user within the event website, this keeps the entire experience aligned with your event brand and thus increases the likelihood of them registering for the event. Now that you've read through all of these tips, the key is to not only implement these best practices but more importantly, to reiterate them as you go along. During the months that your event tickets are on sale, make sure to constantly be measuring the performance of the different channels in order to see which ones are most effective and to optimize accordingly. You'll ideally want your event management software to have a built in dashboard to help you keep track of ticket revenue month over month as well as to measure your marketing campaigns through tracking links and engagement analytics. Being diligent about measuring and optimizing your event promotional strategy will surely pay off in the end. Tap into other audiences that would otherwise be out of your reach. Brainstorm marketing strategies that can leverage the audiences of your sponsors and speakers to make sure you're casting a wide net. Launch content marketing campaigns that both promote your event while offering something of direct value to your audience/potential attendees. Create communities within social media platforms, such as LinkedIn and Facebook, to generate enthusiasm for your event. Think of ways to utilize the resources you already have (previous attendees, social media presence, etc) instead of always looking for new channels and strategies. Measure all of your marketing initiatives and constantly be willing to either re-strategize or double down on a particular channel/campaign. If a potential event attendee is searching for a great event to go to, you want your event website to show up. In order for that to happen, you'll need to make sure your website is structured to have perfect SEO (Search Engine Optimization). While SEO can be a tricky thing to perfect, we've created a free white paper designed specifically to help event professionals improve their ranking on Google search, and thus attract more qualified visitors to their event website. Fill out the form below to get a free SEO eBook!